Inspired by Australia’s most well-known beach, and a desire to make the ultimate tan accessible to everyone, our salon quality formulas work to give you an even, naturally golden tan that hydrates and nourishes .your skin meaning you stay bronzed for longer. Owned and made in Australia. Look like you’ve spent the day at the beach, all year round. A lotion that dries in seconds to reveal a rich, natural looking tan. Infused with Aloe Vera and Coconut, to ensure your tan lasts longer, Bondi Sands’ lightweight, Self-Tanning Lotion will leave your skin feeling soft and smooth. Perfect for light and medium skin tones. 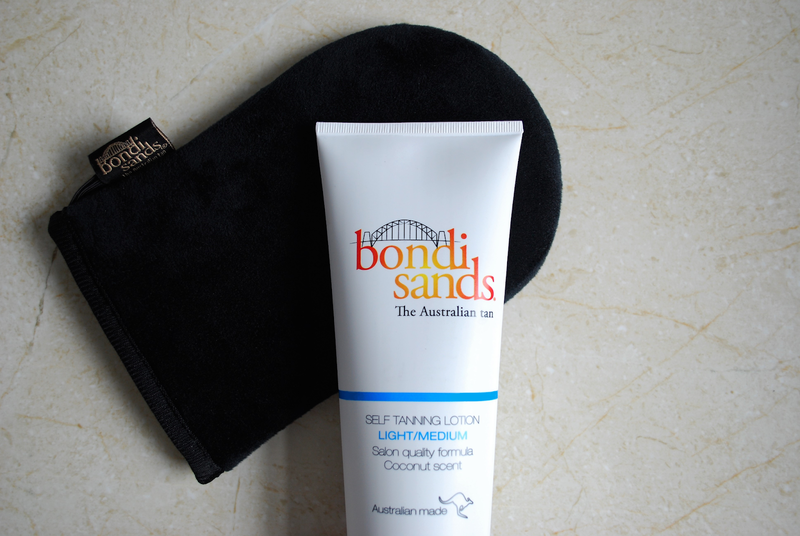 I was kindly sent these two personally selected products from Annalisa to review for Bondi Sands. Firstly, I absolutely love the coconut infused scent of the Self Tanning Lotion in Light / Medium, it smells divine. So after prepping my skin and applying the fake tan with the very soft Application Mit, I immediately saw amazing results (as shown in the above photo). With the Application Mit being as soft as it is, this helps to apply the product evenly all over the body. The tan washes off very easily, meaning you're not left with any unwanted marks when you've finished applying. I'm super looking forward to using this product in the Summertime, especially because of its coconut scent!